Focusrite is a high-class audio equipment brand from England (High Wycombe specifically). They’re manufacturing audio interfaces, consoles, equalizers, and microphone preamps, and it’s safe to say that they’ve done an amazing job over the past three decades. Some of their flagship models are ISA 110 preamp & equalizer from 1987, Forte Console from 1988, the original Focusrite Studio Console from 1990, The Red Range from 1993, Blue range from 1995, and, of course, the Platinum Range from 1998. Their latest inventions are Saffire 6, Forte, RedNet, iTrack Solo, and the VRM Box. 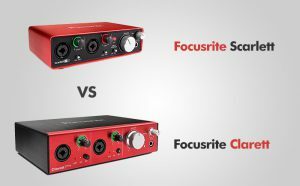 Today we’re going to speak about Focusrite’s most renowned audio interfaces and their differences – the Clarett and Scarlett. The folks at Focusrite have characterized the models from the Scarlett USB interface series with the following attributes – “great speed, high-quality, superb conversion, excellent low-latency performance, and sample rates up to 192kHz”. They’ve also noted that this series features their best-selling USB interface models in the world, and we’ve found out why that is so. Namely, the Scarlett USB audio interfaces are incredibly plain in nature – they don’t look futuristic, and the entire feature outfit is remarkably easy to use. Of course, this category is pretty broad, as there are small (yet formidable) models, as well as powerhouses with plenty of awesome settings and controls. As we’ve already mentioned, the Scarlett USB Audio Interface is quite versatile. It is comprised of ten premium-quality models, each offering a different set of benefits. Similar technologies and hardware were used in the manufacturing process of each of the aforementioned models, and they all feature ultra-low latency which allows high-performance and easy connectivity. It’s important to note that Focusrite’ Scarlett series USB audio interfaces are older than models from the Clarett series. That means that these models are cheaper, but that certainly doesn’t mean that they should be overlooked. One of the best things about Scarlett audio interfaces is that they’re remarkably compact – for example, the smallest model is the Scarlett Solo which is as small as it is lightweight. On the other hand, the largest Scarlett interface is the OctoPre which is outfitted with 8-channel mic inputs, 8 line inputs, and sixteen fine-tune control knobs. Though bulkier than the Scarlet Solo, even the OctoPre can be considered as compact. Scarlett series is also characterized with user-friendly audio interfaces. The general feature positioning is plain and convenient while the features themselves are clearly marked and grouped in the simplest way possible. Low latency and impeccable sound quality are guaranteed, although models from the Clarett series fare better in this field. Seeing what the Scarlett series offers, we’ve certainly set our expectations high. Now, the only thing that’s certain is that the Clarett series can’t be bad (per se), as Focusrite has already proven that they mean business. Even though this generation of USB audio interfaces features a humbler catalog (as it is comprised of only five USB interface models), each interface within it is strong, fast, and boast ultra-low distortion and latency. One of the best things about the Clarett series is that USB audio interface models here use exceptionally versatile technologies (software) – XLN Audio, Softube, Loopmasters, Ableton, Focusrite, and other big names have had a part in the play. There’s a bunch of improvements when we compare the Clarett series to the Scarlett generation. In fact, this section will give you an easy answer to the question of “how do they differ?”. Much like the models from the Scarlett series, Audio interfaces from the Clarett series are also inspired by ISA type microphone preamps. Generally speaking, Clarett audio interface models boast lower input noise – for instance, the best Scarlett interfaces could do is -100dB (2i2 taken as an example) as opposed to -128dB of Clarett interfaces. Secondly, the dynamic range of Clarett interfaces is greatly superior to that of Scarlett generation models (118dB compared to 114dB). This is, however, represented through the so-called logarithmic scale, so the difference is greater than it appears. Thirdly, Clarett audio interfaces all operate on the 64-bit architecture. The same can be said to Scarlett audio interfaces if they weren’t ported from 32 bit to 64 bit via the specific framework. This isn’t too much of a big deal, but it’s a big difference that shouldn’t be overlooked. Lastly, Focusrite has addressed a major flaw they’ve made with the Scarlett series. Namely, the lights were all too flashy and bright which caused problems for some people. The Clarett series takes care of that with six levels of light power. Again, this is not the matter of performance, rather it’s a point in convenience awarded to the Clarett generation. On another hand, Clarett USB audio interfaces cost quite a lot – they’re certainly more expensive than Scarlett interfaces, but that’s only normal since they’re bringing a plethora of superior benefits onboard. Generally, comparing the Scarlett series USB audio interfaces to Clarett generation of audio interface models seems like pitting old versus the young. The Focusrite began their magnum opus with the Scarlett generation, but they’ve only reached it and achieved it with Clarett models. Let’s not discredit the former though – Scarlett audio interfaces are powerful, capable, and pretty versatile, it’s just that Clarett interfaces do everything a bit easier and better. Of course, there’s also the issue of cash. People who are looking for a quality USB audio interface for the buck usually opt for Scarlett models as they cost less – those willing to pay an arm and a leg should consider Clarett interfaces.